Engines: 2 Pametrada steam turbines, double-reduction gearing. 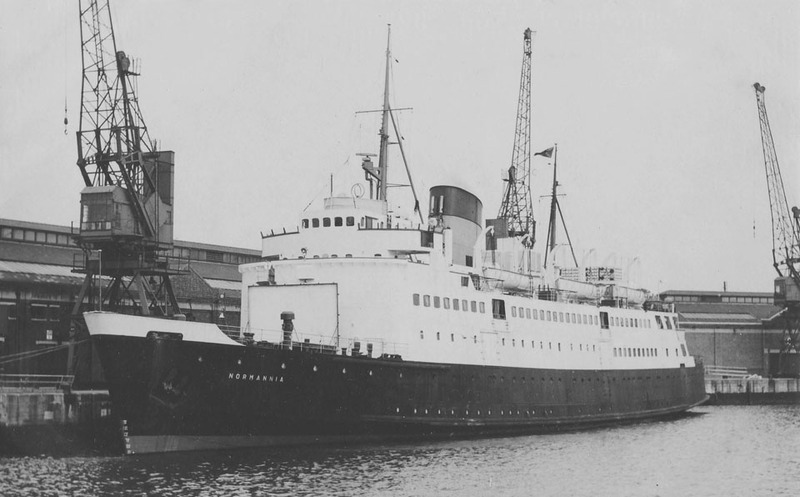 January 16th 1952: Delivered to British Transport Commission, Southern Region, London, England (home port Southampton). 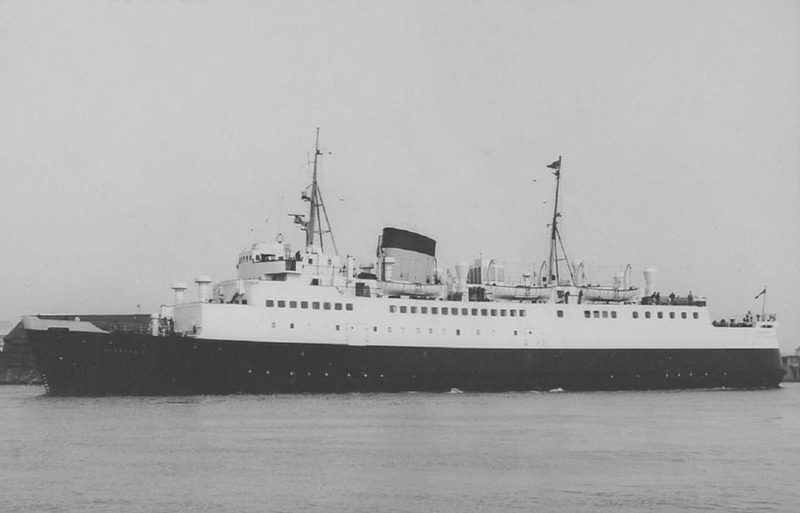 March 3rd 1952: Commenced service between Southampton – Le Havre. 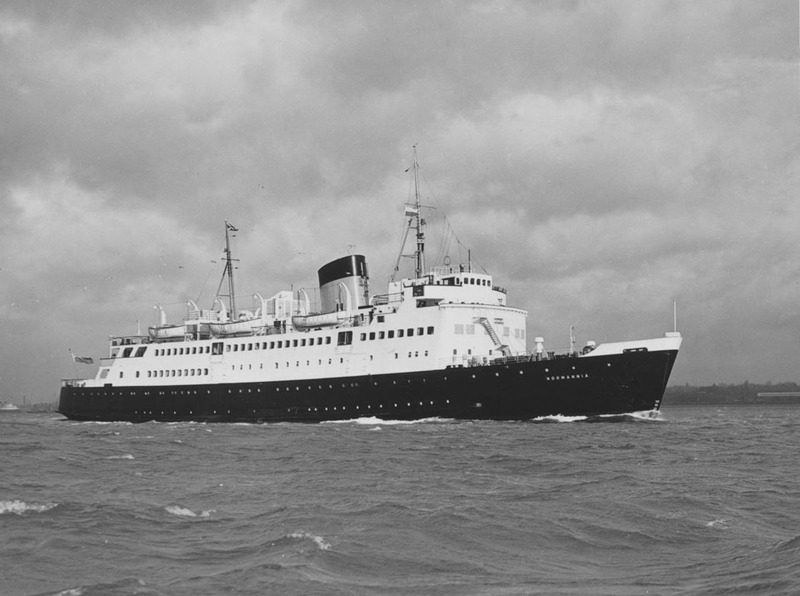 September 1953 – October 1953: Operated between Harwich – Hoek van Holland. 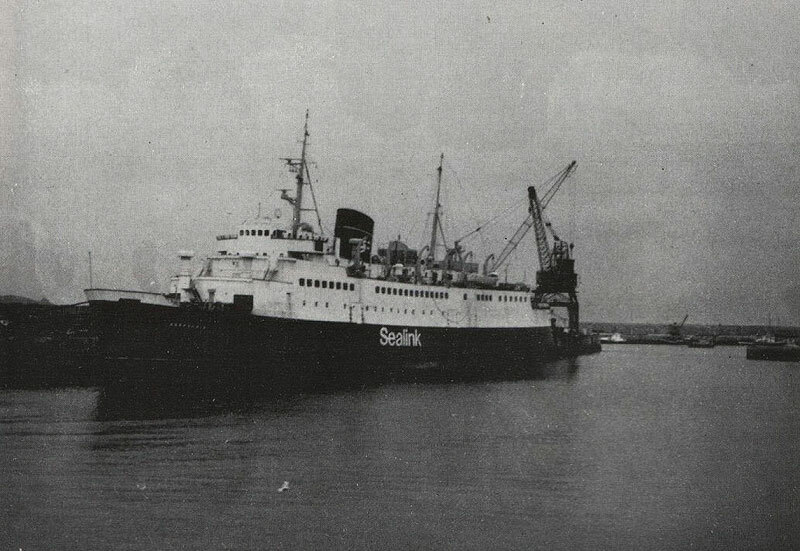 October 1962: Completed operations between Southampton – Le Havre. 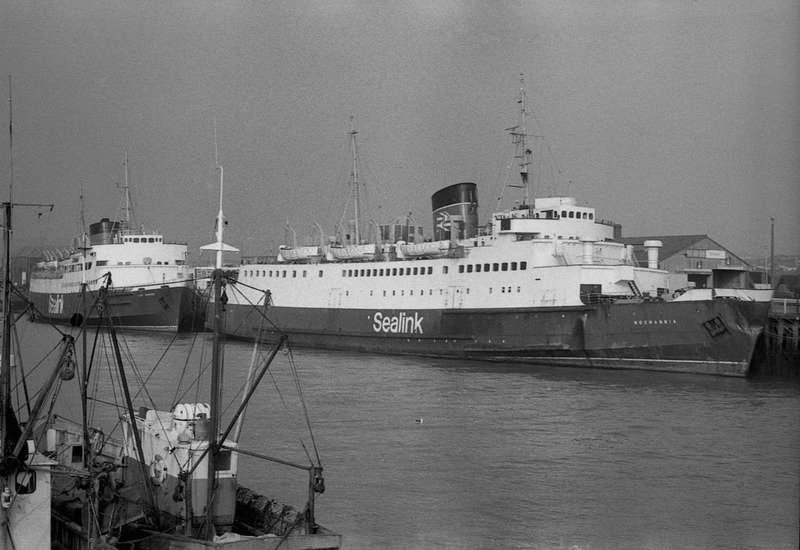 1963: Returned to Weymouth – Channel Islands service (March 12th – 20th replacing CAESAREA which had been withdrawn with compass trouble). 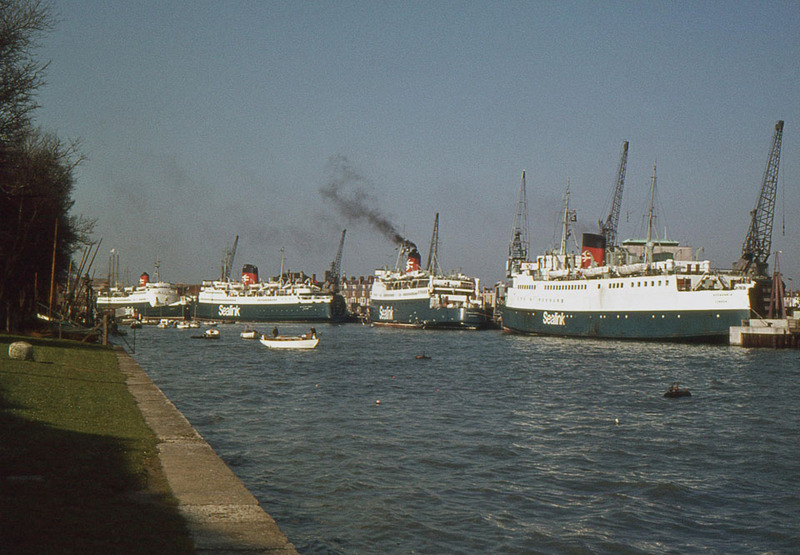 December 3rd – 4th 1963: Last trip Le Havre – Southampton. 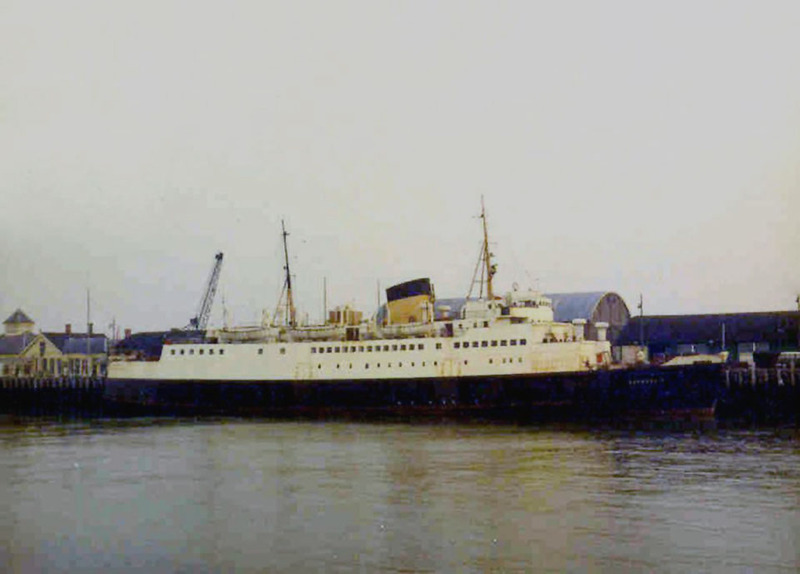 December 5th 1963: Sailed for Hawthorn Leslie’s yard on the Tyne where work was carried out to convert her to a stern loading car ferry (cost (£280,000). 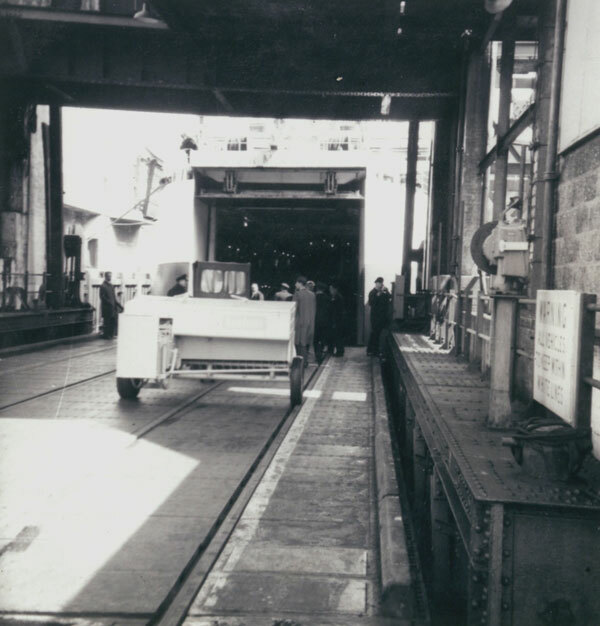 January 1st 1963: British Railways Board succeeded British Transport Commission. 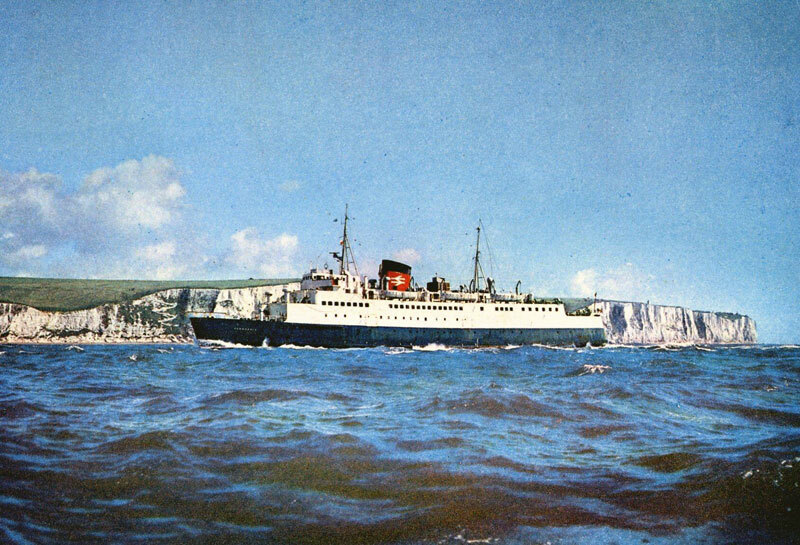 April 5th 1964: Arrived at Dover after rebuild. 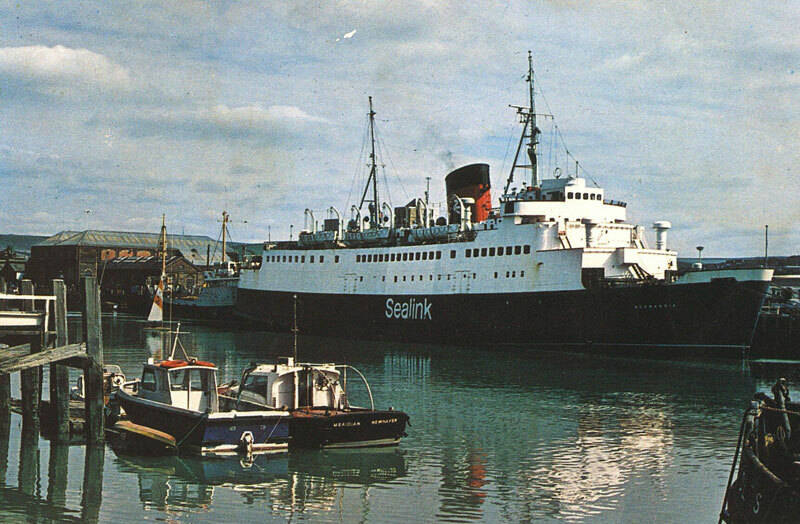 April 9th 1964: Berthing trials at Newhaven. 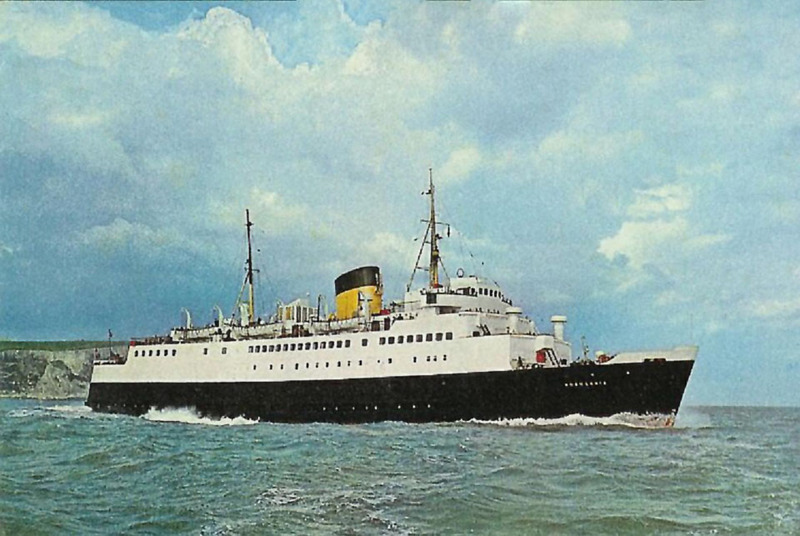 April 21st 1964: Inaugural car ferry voyage Dover – Boulogne. 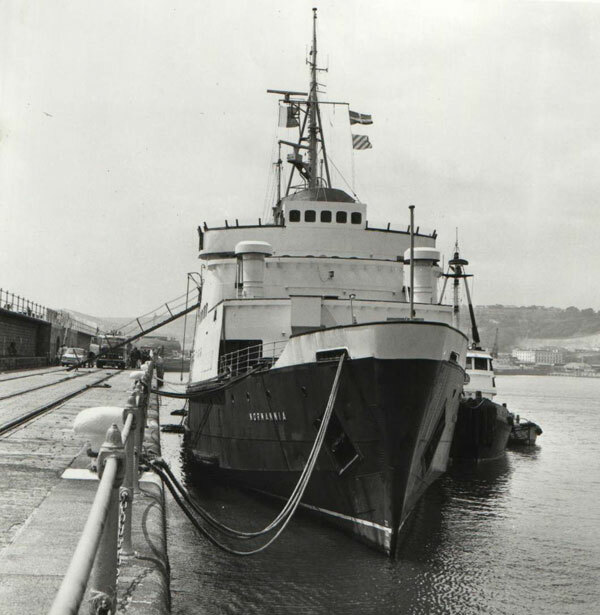 July 1964: Collided with the breakwater in Dover sustaining only minor damage. 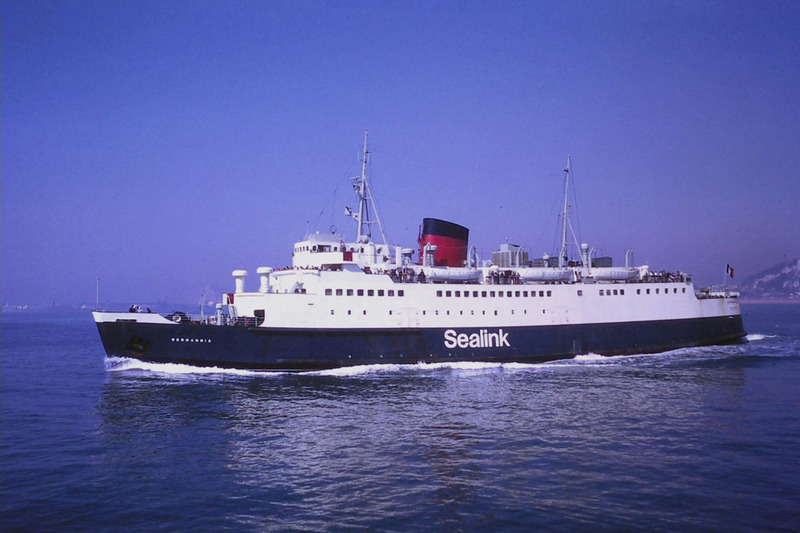 July 9th 1965 – July 19th : Operated between Holyhead – Dun Laoghaire. 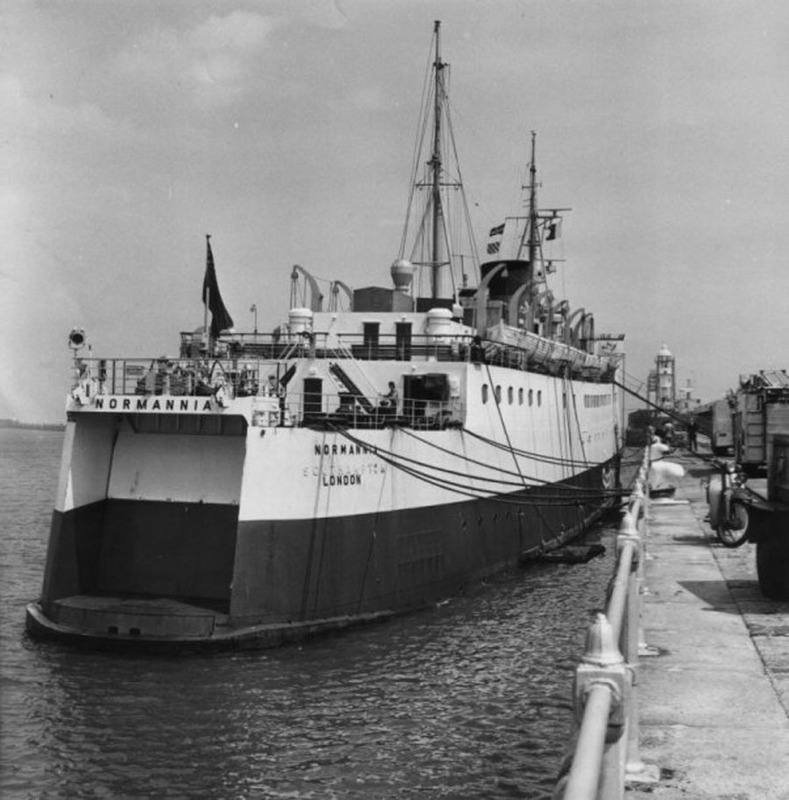 June 1967: Special trip from the Dover ‘Train Ferry Dock’ to Boulogne carrying agricultural machinery. 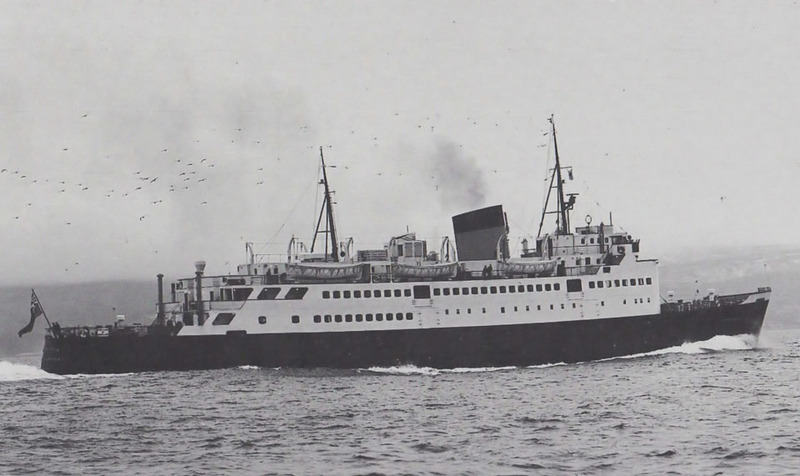 April 1968: Registered to SNCF and running on the Calais – Dover route. 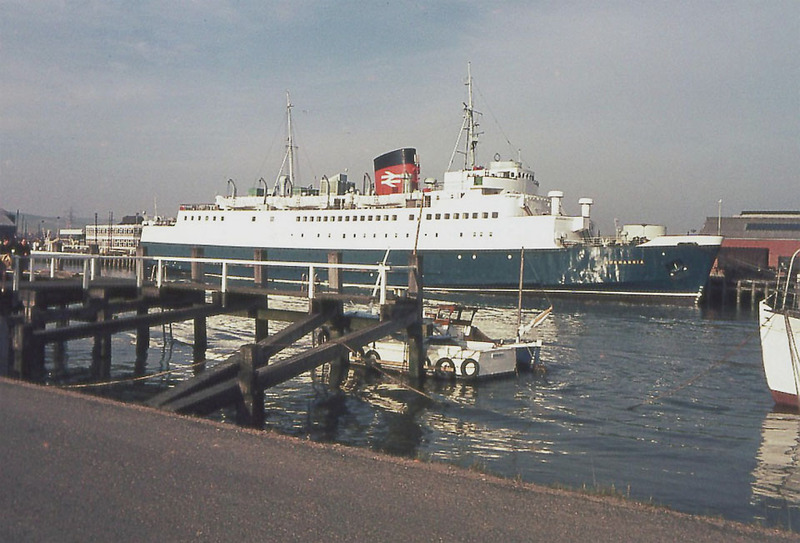 September 17th 1968: Laid-up in Harwich. 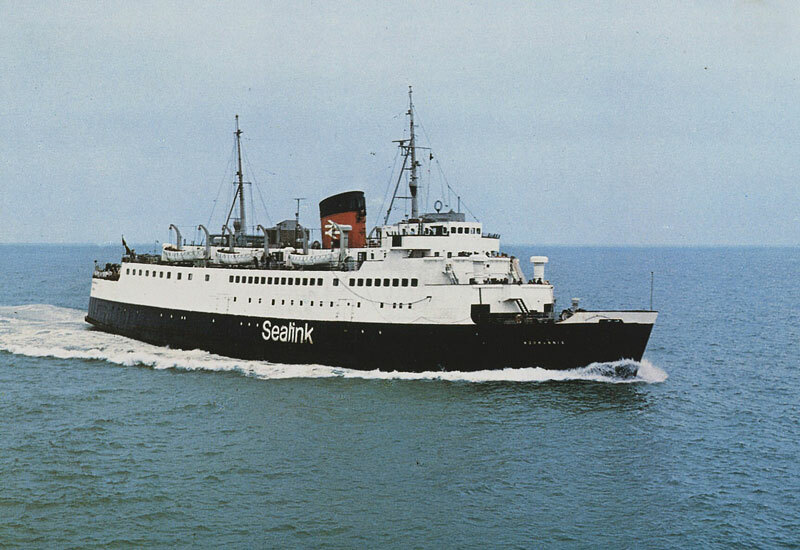 October 25th 1968: Operated one round trip between Harwich – Hook of Holland. October 1968: Registered to British Railways Board, Southern Region, England. 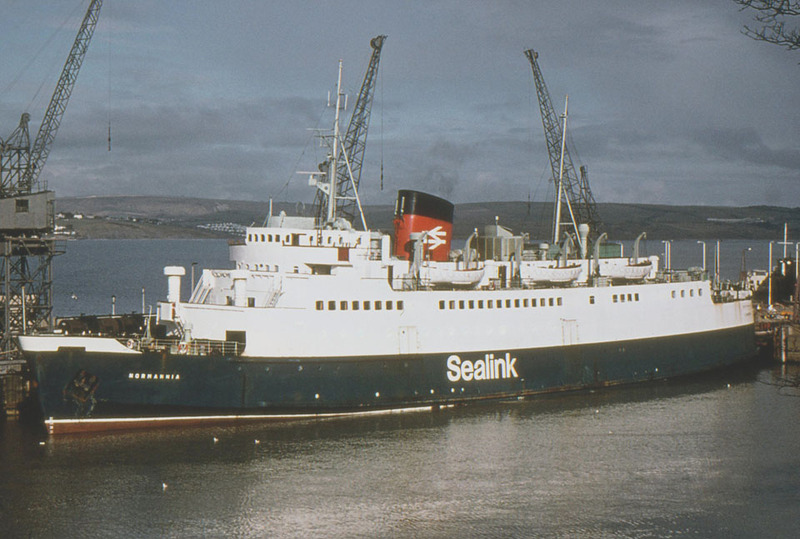 November 1969: It was announced that British Rail’s Shipping and International Services Division (SISD) had adopted the new brand name Sealink and as a consequence all vessels were painted in the new house colours. 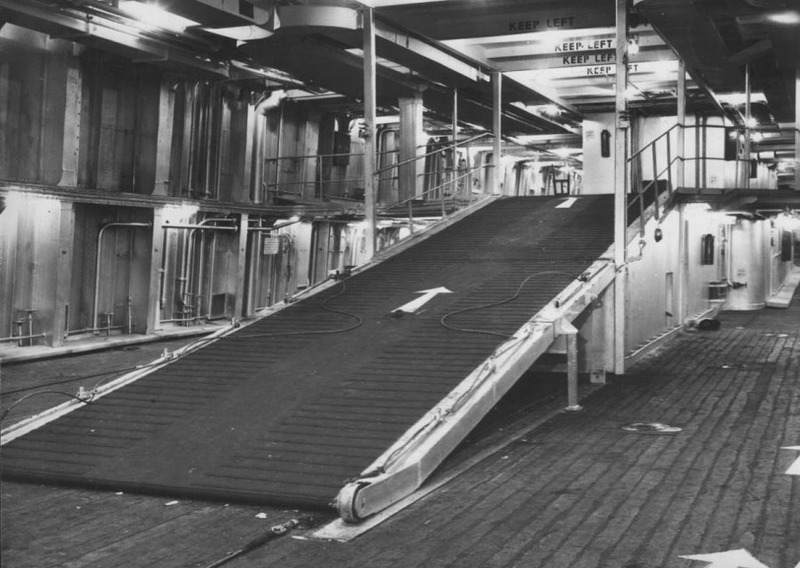 June 16th 1972 – June 28th 1972: Chartered to Townsend Car Ferries Ltd, Dover, England and introduced between Dover – Zeebrügge. 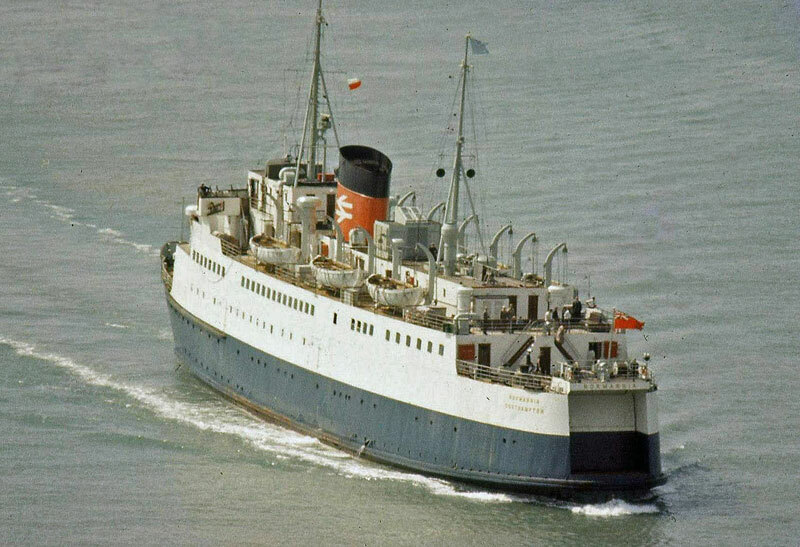 April 28th 1973: Ran a special charter trip between St Malo and Jersey. 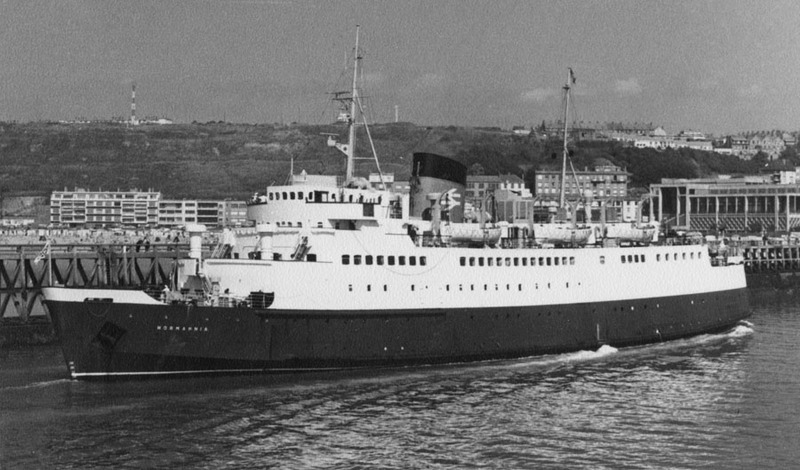 April 1973: Sold to SNCF (home port Calais) running between Dover – Calais, with return trips from Boulogne – Dover. 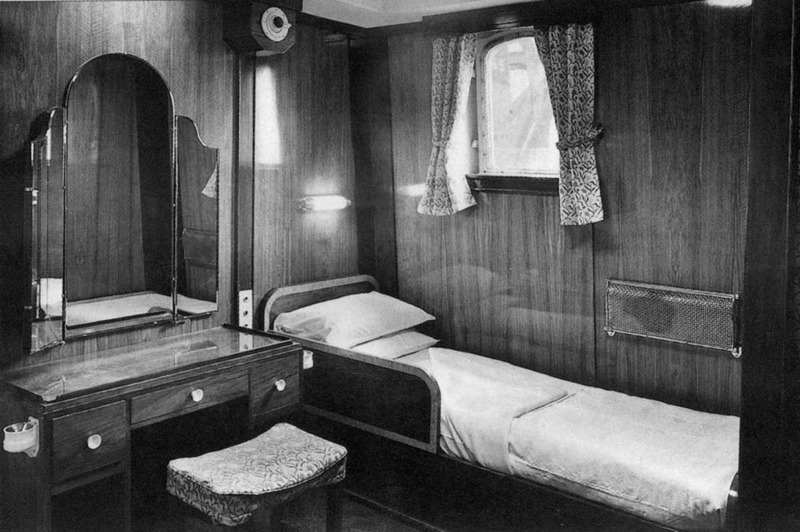 October 1973: Re-registered to British Railways Board, London, England. 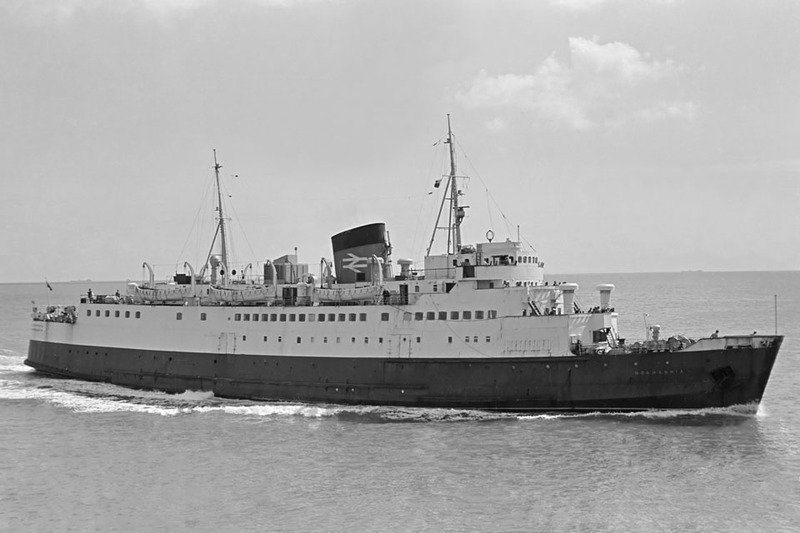 December 13th 1973 – March 1974: Operated between Weymouth – Jersey – Guernsey, at the same time briefly running between Weymouth – Cherbourg. 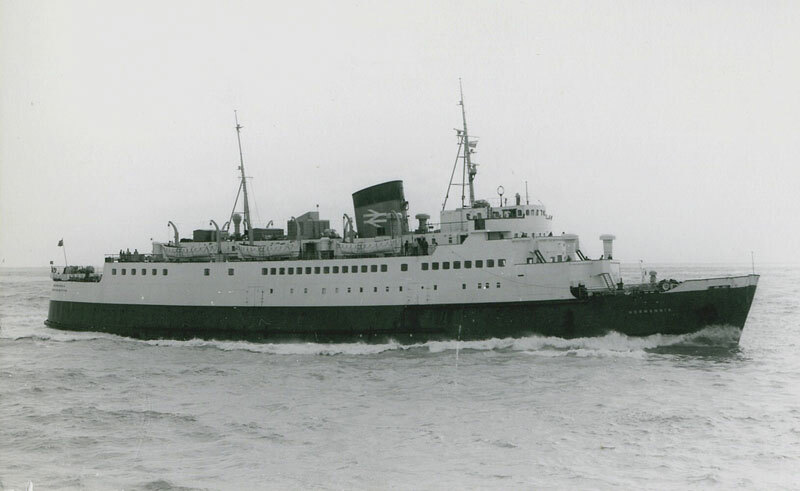 July 1st 1974: She then moved round the coast once more and between Dover – Boulogne. 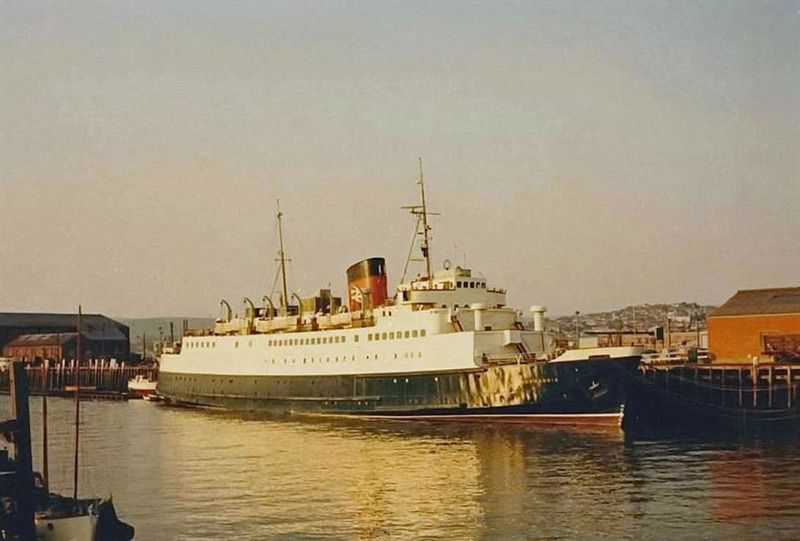 July 9th 1974: Struck the submerged remains of one of the old paddle steamer jetties at Dover whilst moving from one berth to another at the Admiralty Pier. 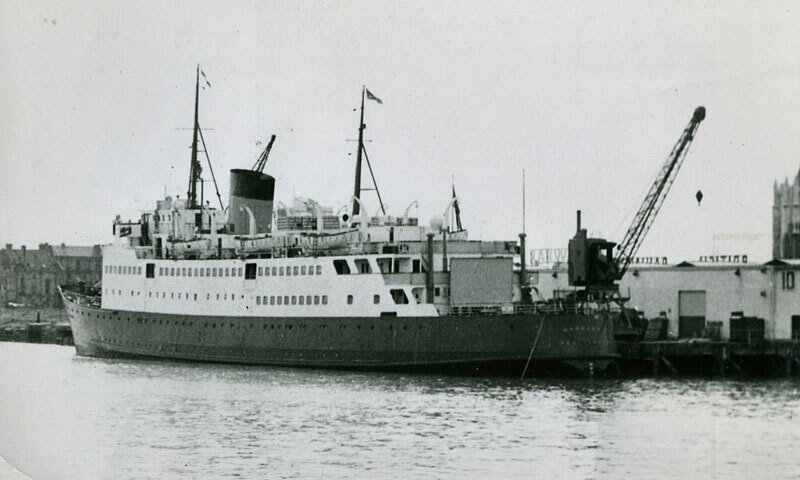 The result was a ten-foot-long gash ripped in her side, with water pouring in and flooding her engine room, seriously damaging the turbine machinery. 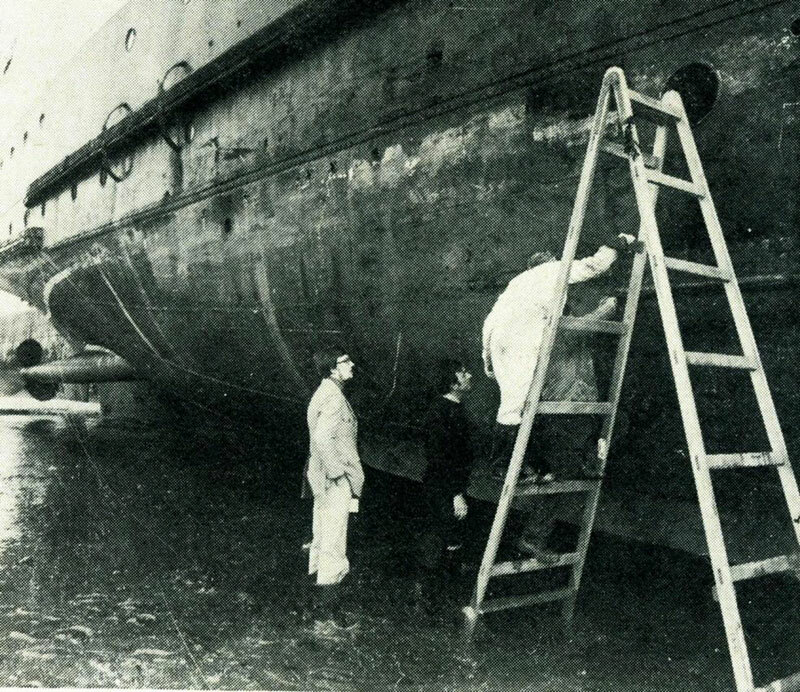 Repairs were made at Middlesbrough. 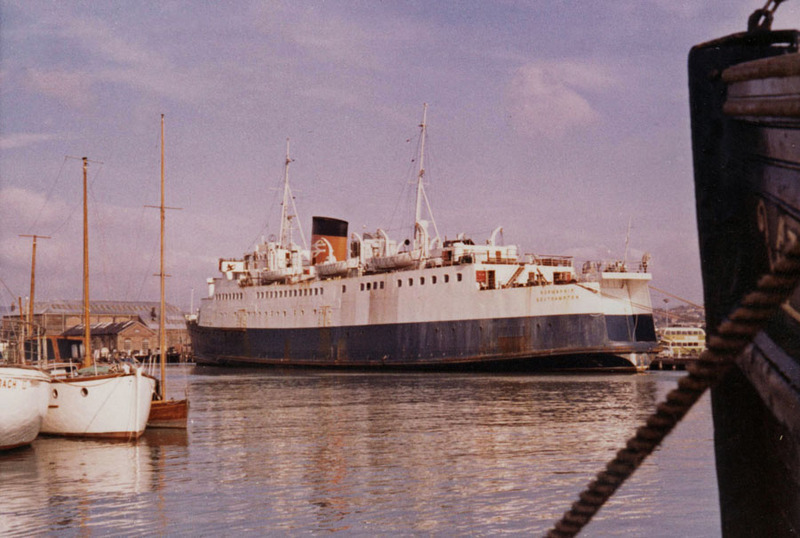 October 26th 1974 – October 1975: After being repaired operated between Weymouth – Jersey – Guernsey. 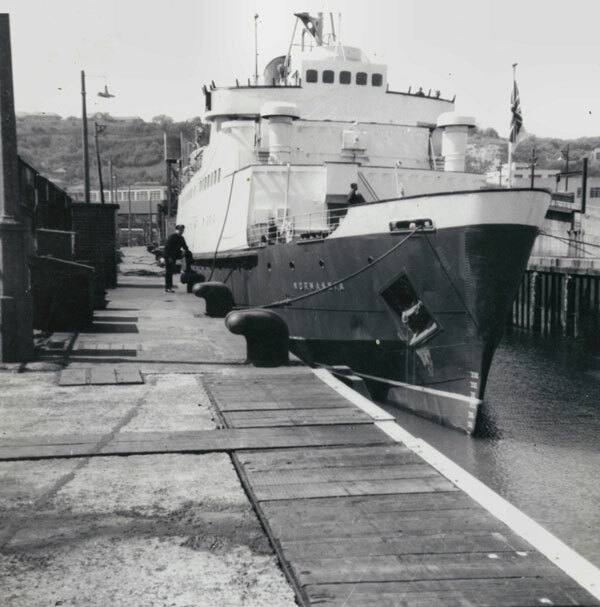 1975: Struck the pier head at Guernsey, which split a seam in the plates on her starboard hull, letting water into the engine room. 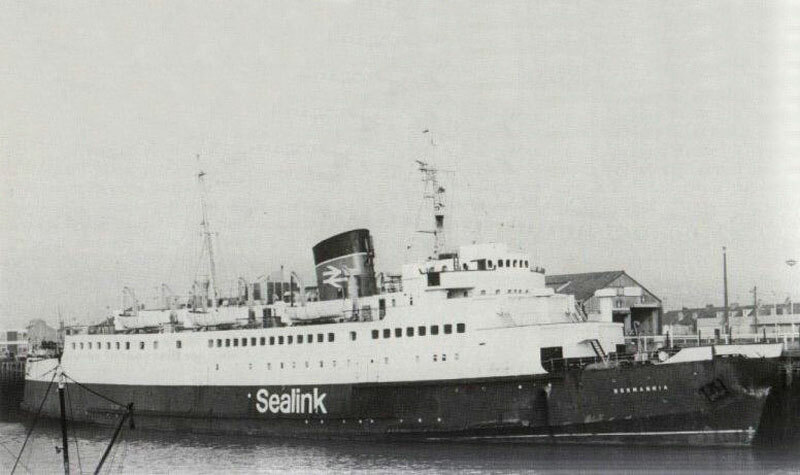 Repaired by local marine engineers. 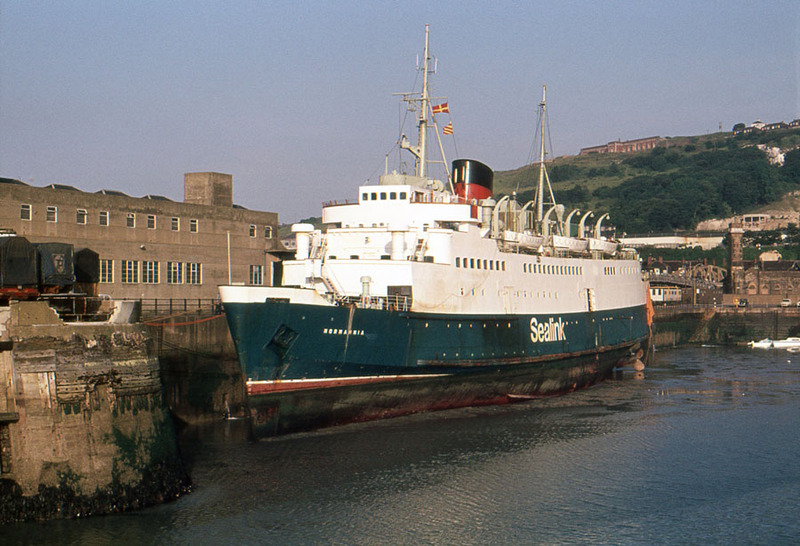 1975: Laid up in Newhaven. 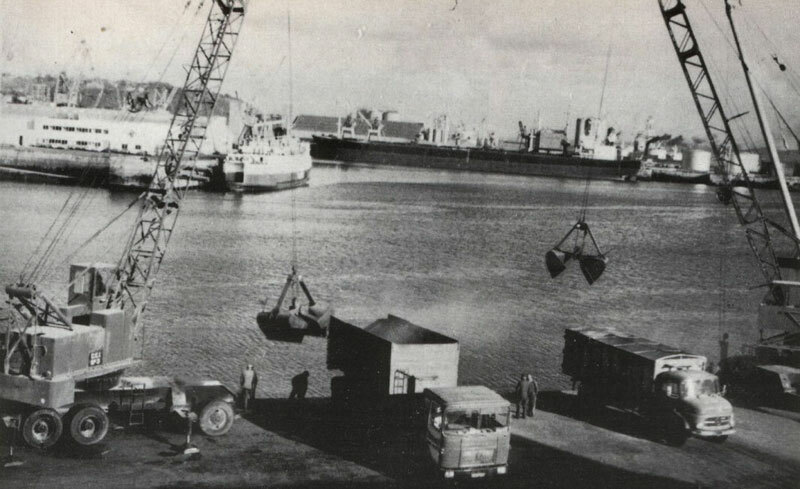 July 5th 1976: Inaugurated the new Eastern Dock/Dover – Dunkerque West) ro-ro service. 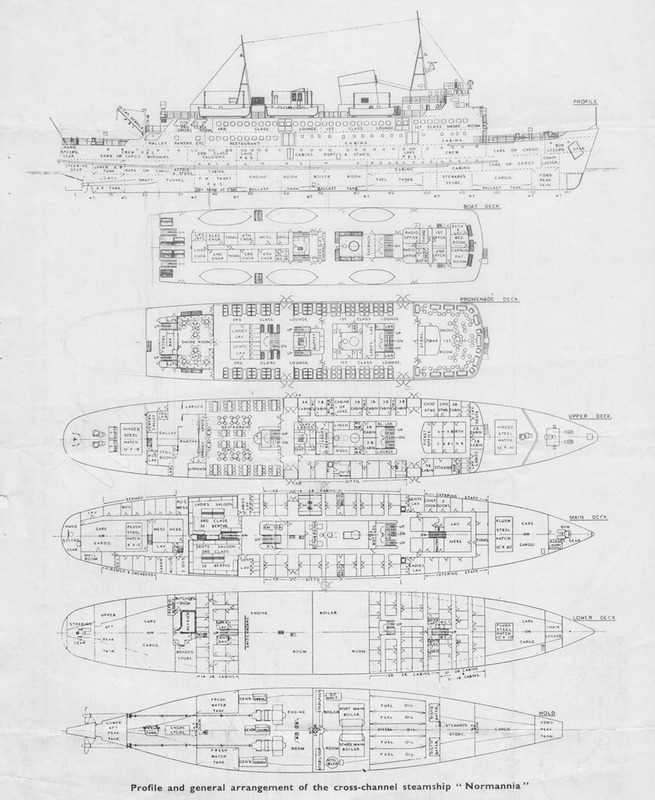 Service taken over by COMPIEGNE. Neither ship was satisfactory and the new initiative was unsuccessful. 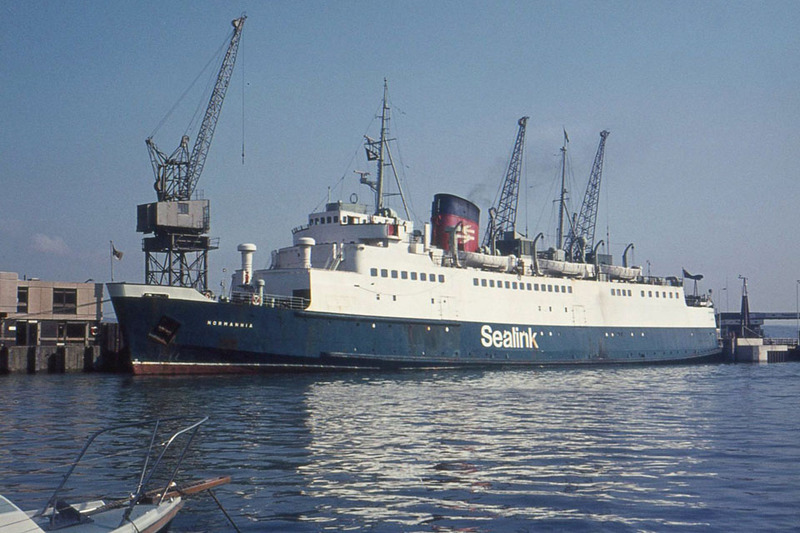 June 1978: Sold to Red Sea Ferries, Dubai but it is believed that the contract fell through before completion. 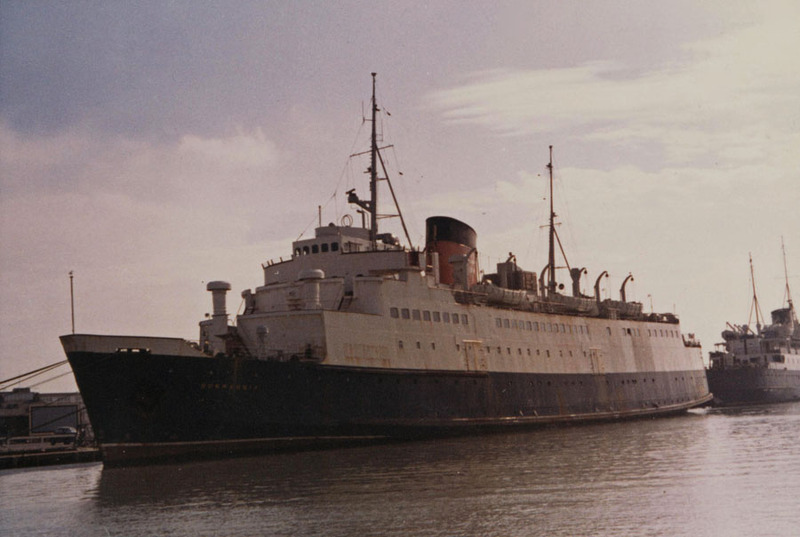 Her new owners even paid a deposit and planned to tow her to Rotterdam for overhaul before taking her out via Suez. 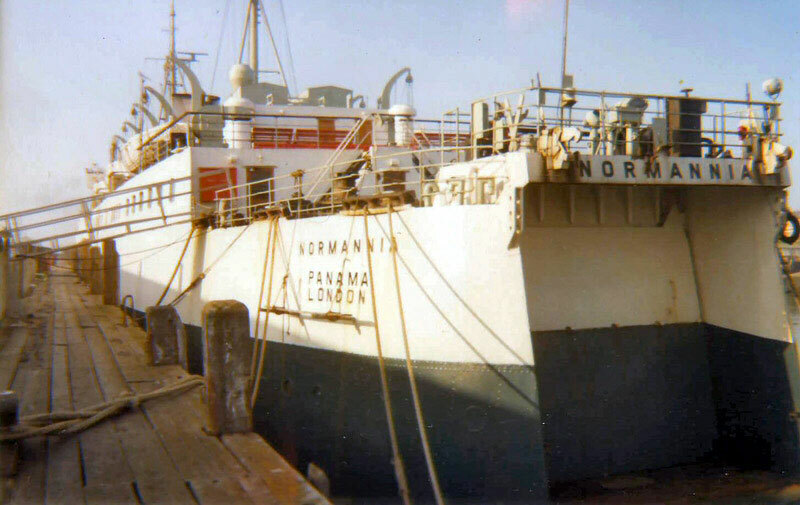 A party of “foreign gentlemen” duly turned up at Newhaven, painted a thin white line around her funnel and added “Panama” to “Normannia” and “London” which already appeared on the ship’s stern. 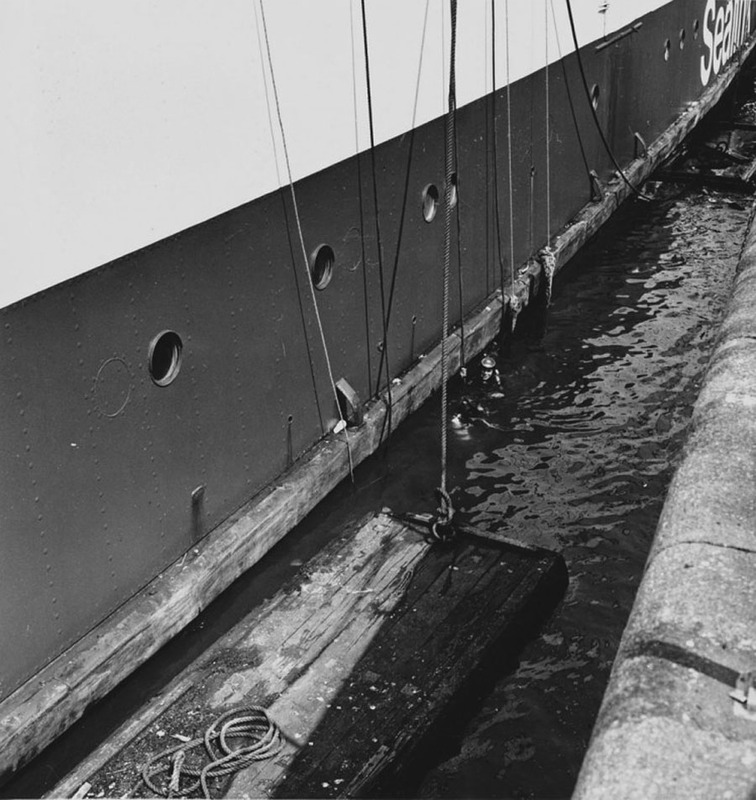 A telegram then arrived advising them that the deal was off and they promptly departed leaving slings and trestles still in place. Had the telegram arrived a day later, we would have known what her new name was to have been. November 29th 1978: Sold for scrapping in Gijon, Spain. 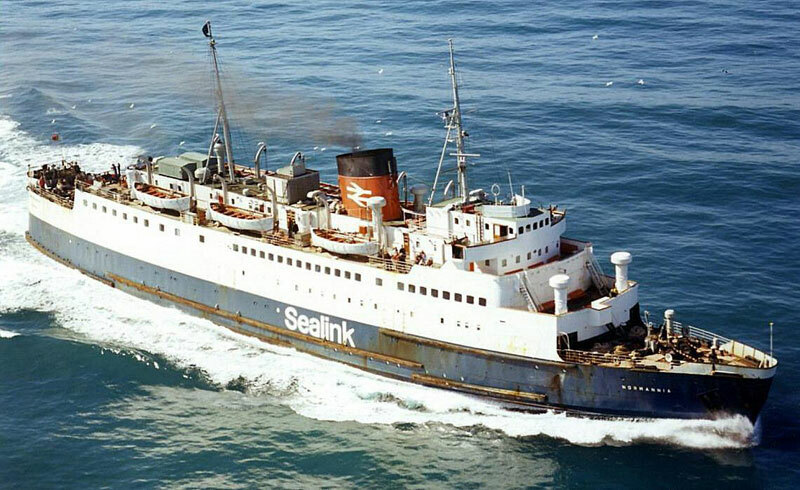 November 29th 1978: Sailed from Newhaven bound for Falmouth to bunker, arriving at 0830hrs on the 30th. 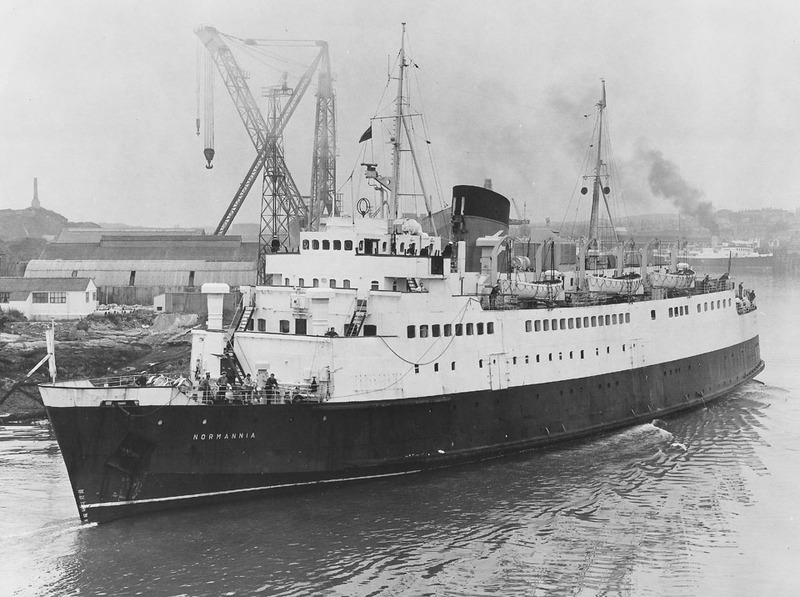 Sufficient oil and fresh water were shipped at Falmouth for the journey to Gijon, although initially delayed to bad weather she departed at 20.25 hrs on December 2nd for Brest to fill up for the passage across the Bay of Biscay. She arrived at Brest roads 08.50 hrs on the 3rd sailing again at 0018 hrs on the 5th , finally arriving at Gijon at 21.00 hrs the same day. All information is believed to be correct and no responsibility is accepted for any errors or omissions found. All items included in this article are subject to © copyright. We would like to take this opportunity of thanking: Bernt Anderson, Jim Ashby, Andy Gilbert, Ted Ingham, A G Jones, Ken Larwood, Derek Longly, William MacDonald, Ken Smith, Michael Woodland and Andreas Wörteler for their assistance in compiling this feature. Fascinating stuff and very thoroughly researched. 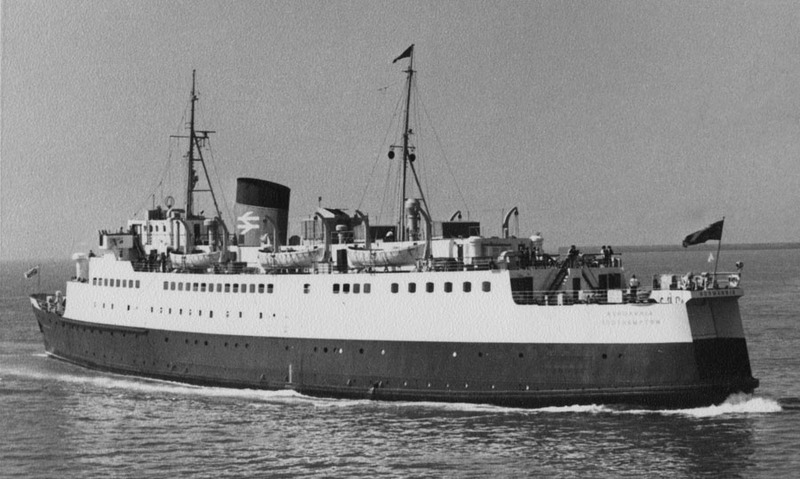 Back in the 1960s, my parents used to take me and my sister on touring holidays to France via Dover-Calais and I remember the Normannia. 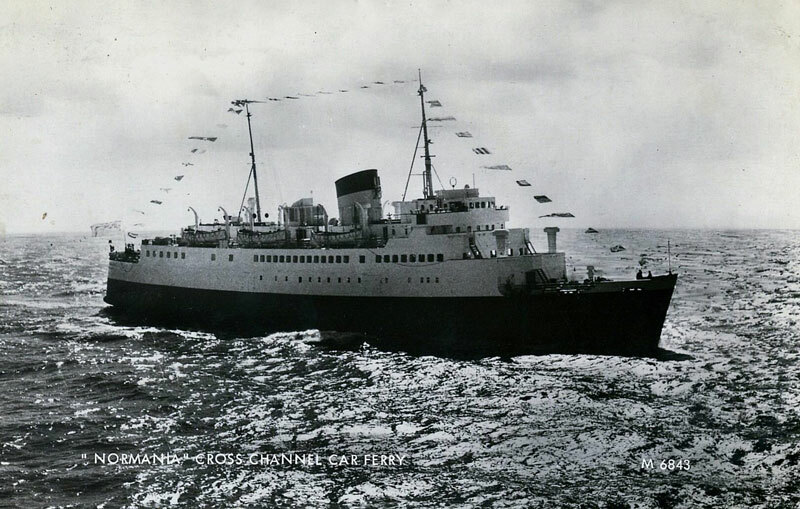 Mainly because my mum (who was prone to seasickness) used to regard it as the prelude to an uncomfortable voyage.